(L-R) BAE Systems International Sales Director – Typhoon and Hawk, Andy Lavin and BAE Systems International Ltd South East Asia Managing Director, John Brosnan with the Eurofighter Typhoon model at the BAE Systems stand at 16th Defence Services Asia 2018 in Kuala Lumpur. Picture courtesy of BAE Systems. KUALA LUMPUR: BAE Systems Inc, the wholly owned US subsidiary of the British defence, security, and aerospace company BAE Systems PLC, is planning to set up a maintenance, repair and overhaul (MRO) facility and a vocational training centre in Malaysia. 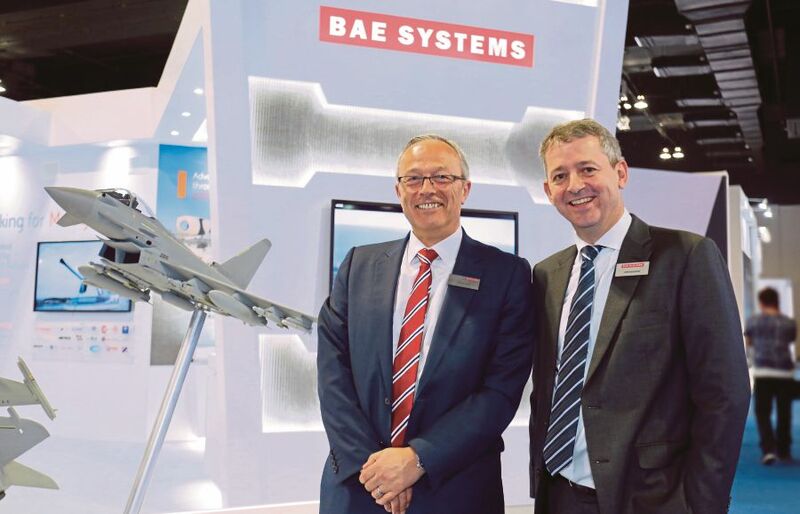 BAE Systems International Ltd South East Asia managing director John Brosnan said the conditional assessment would be dependent on Malaysia’s decision to choose the company’s combat aircraft, Eurofighter Typhoon for Royal Malaysian Air Force (RMAF) multi-role combat aircraft (MRCA) programme. “Both developments will be based on a joint-venture with local players. It will also provide economic value to the local market about five times of the value of the aircraft purchase,” he told NST Business in an exclusive interview yesterday. Brosnan said the investment’s facility would be spent over 25 years, creating more than 20,000 high-skilled jobs for the locals including the establishment of vocational training centre for the local aerospace sector. “We will develop the technical vocational training centre in phases over 10 years with the involvement of Bristol University and Loughborough University,” he added. Brosnan said BAE Systems had been working with the RMAF for nearly five years to test its combat aircraft. “Hopefully, a deal will happen soon for the Eurofighter Typhoon,” he said, adding that there is a requirement for Malaysia to upgrade its aerial surveillance capabilities. Brosnan said the fighter jet delivery could be made in about four years, subject to the RMAF requirements and negotiations. The fighter jet package could include the unit, support services including maintenance and repair as well as training modules for local technicians. Malaysia has been for several years considering to replace its ageing combat fighters, Russian-made, MiG-29s, which currently are not in service. However, the decision to acquire new 18 fighter jets has yet to materialise as the country is preparing its focuses on the 14th General Election, which will be held on May 9. It was made to understand that the decision could only be finalised after the election with regards to potential purchase either Eurofighter Typhoon or France’s Dassault Aviation, Rafale fighter jet. “Every country has economic pressure. Defence is a significant cost, where governments have to allocate certain spending priorities. “That’s why we have affordable solutions whereby, rather than selling new defence equipment, we also help countries to upgrade their existing equipment with installation such as new missile system and radar,” said Brosnan. However, he said there would come to a point where governments can’t just upgrade their defence systems. “Malaysia is currently considering the replacement aircraft for its MRCA programme,” he opined. He said Malaysia is certainly an important defence-military market in South East Asia for BAE Systems with over 50 years establishment in the country. “We regard Malaysia as a first-world military customer. We are the largest international defence-equipment supplier to the Malaysian armed forces including frigates, trainer aircraft (Hawk), armed vehicles, missile systems, ground-based air-defence systems, radars and bridging systems,” he said. BAE Systems International sales director – Typhoon and Hawk, Andy Lavin said the company provides the cheapest cost of ownership to operate the Eurofighter Typhoon. “Currently we have over 520 units in service from eight countries including the United Kingdom, Germany, Austria, Saudi Arabia, Kuwait, Oman and Qatar. “The fighter jet is collaboratively developed and manufactured by BAE Systems UK, Leonardo – Aircraft Division (Italy) and Airbus Defence & Space (Germany and Spain),” he said. The Eurofighter Typhoon is a highly capable and extremely agile multi-role combat aircraft, capable of being deployed in the full spectrum of air operations including air policing, peace support and high intensity conflict. “Currently we have secured over 100 additional orders with potential orders of 184 aircraft from countries including Germany, Saudi Arabia and Spain,” he said. Lavin said Eurofighter Typhoon sales could reach 1,000 aircraft globally in the next five years, backed by on-going active campaign promotion in countries including Belgium, Finland, Poland, Switzerland, Bulgaria, Malaysia and Canada.